Vietnamese martial art Vovinam will be featured in an action film to be shot by this year-end under the cooperation of a Cambodian royal official and a Hollywood film director and actor. The film was initiated by H.E. Oknha Rat Sokhorn, who is skillful at the Vietnamese martial art, and Hollywood film director Ace Cruz. The film “Fight for Life” tells the story of a Cambodian boy who rises to fame thanks to the Vovinam ring. His mother gets raped by an illegal Thai logger when she is 17 years old and gives birth to him. His father is later killed by other loggers and his mother has to prostitute herself to raise him. The little boy earns his living by snatching on the street and he comes to a milestone when he steals the camera of an American tourist who later helps him by sending him to learn Vovinam with a Cambodian businessman. After making progress in Vovinam, the Cambodian boy is sent to another master to be trained in more techniques and achieve success in the freestyle ring in Cambodia, the Philippines, Thailand, and the U.S. Famous American actor Michael Madsen and former world heavyweight boxing champion Evander Holyfield will join the casting of the flick to be shot in Cambodia, Vietnam, Thailand, the Philippines, and the US. The expense of the film is estimated at US$2-10 million. H.E. Oknha Rat Sokhorn, a high-ranking royal official in Cambodia, and Hollywood film director Ace Cruz met for the first time during Vovinam fights at the 27th SEA Games in Myanmar in 2013. Then Cruz attended the tournament to support his nephew in the high jump competition and H.E. Oknha Rat Sokhorn instructed Cambodian fighters in Vovinam matches. H.E. 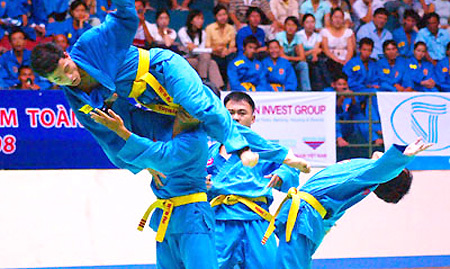 Oknha Rat Sokhorn is skillful at Vovinam techniques and the vice chairman of the World Vovinam Federation.